The secretive street artist Banksy ended his self-announced monthlong residency in New York City with a final piece of graffiti, a $615,000 painting donated to charity and a debate: Is he a jerk or a genius? Banksy, who created a new picture, video or prank every day of October somewhere in the city, spent his last day like thousands of graffiti artists before him: He tagged a building near a highway with his name in giant bubble letters. The twist was that these letters were actual bubbles: balloon-like inflatables stuck to a wall near the Long Island Expressway in Queens. As if to underscore his dual identity as both a street punk and an art-world darling, he also donated a painting that was auctioned off Thursday night for $615,000. The original painting first sold for $50 at a Manhattan thrift shop that benefits Housing Works, an organization that fights homelessness and AIDS. Banksy added a Nazi soldier to the landscape scene and Housing Works sold it in an online auction. Throughout his 31 days here, Banksy put pictures of his work on BanksyNY.com, with clues as to locations but nothing precise. That spawned a treasure hunt by fans who hunted the works down, shared locations via social media, then swarmed to see them. Banksy, the British graffiti artist causing a sensation in New York City, says he sold a few of his artworks over the weekend for up to $60 apiece, far below the thousands they typically fetch. Tracie Strahan reports. 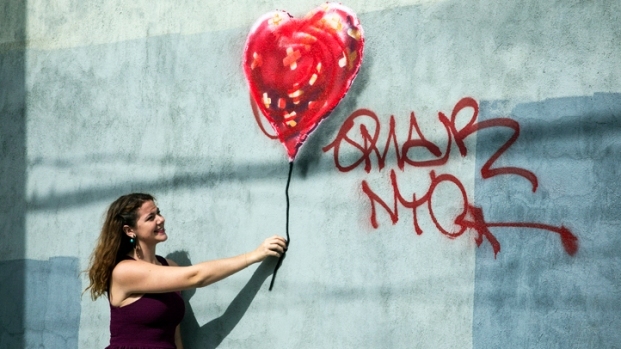 But by the time Banksy was done, New Yorkers were divided in their opinions. Some tweeted "Go home, Banksy!" Others declared their admiration. The turning point for many was an essay he wrote criticizing the building replacing the World Trade Center. Banksy called the new design "vanilla ... something they would build in Canada," and added, "It so clearly proclaims the terrorists won." He offered the essay to The New York Times. The paper wouldn't print it, so he posted it on his website. "The terrorists won" comment upset many New Yorkers, including Brian Major, 51, of Brooklyn. "Enough!" Major said. "Who is this guy? Everybody's got a right to an opinion but what gives him any kind of credibility in New York? Shut up, Banksy! Go home!" DNAinfo.com reporter Katie Honan talks about the hunt on the streets and walls of New York City for new works by Banksy, the famous British street artist. A lifelong New Yorker, Major says he understands graffiti culture, and he also appreciates fine art. But he doesn't think Banksy's art is all that good — "though I'll give him credit, he's a good marketer." But Sean Lynch, 25, of Staten Island thinks Banksy is "one of the more captivating artists of our generation." Lynch said it was magical visiting Banksy sites around the city and hearing conversations about art that the works inspired, with "people of all different walks and cultures sharing opinions, sharing stories. ... The walls started to talk to them, in a way." Banksy, who refuses to reveal his full identity, began his career spray-painting buildings in Bristol, England. In New York, many of his images were silhouetted figures or spray-painted messages. The art ranged from a stencil of a dog lifting his leg on a hydrant to a video of a "slaughterhouse delivery truck" filled with stuffed animals. Some works were defaced by other graffiti artists. But interest grew with each piece, and at least one Banksy street work was covered with Plexiglas to preserve it. He also sold some pieces, unadvertised, for $60 on the street. Radhika Subramaniam, a professor at Parsons The New School for Design in Manhattan, says Banksy is part of a long tradition of graffiti artists like Keith Haring and Jean-Michel Basquiat whose work ultimately earned recognition from the art establishment. But he also fits into a contemporary trend of opening up public spaces to conversations about who owns them and what can happen there — especially in today's cleaned-up New York, where Mayor Michael Bloomberg, when asked about Banksy, called graffiti "a sign of decay and loss of control." OK, but is Banksy any good? "There's plenty of wit in what he does, as well as some thoroughly ordinary, sometimes pleasant, sometimes banal, but sometimes sweet things," Subramaniam said. But he's also "not a naïf in the art world. After all, who would care if you or I were to set up a blog and enact a residency like this? It's only because he's able to marshal this kind of PR and marketing that ... catapults his residency to another level and elicits these polarized points of view." In a final gesture that was simultaneously serious and self-mocking, audio commentary posted Thursday on Banksy's website called his final piece— his name in bubble letters by the road — "an homage ... to the most prevalent form of graffiti in the city that invented it for the modern era. Or it's another Banksy piece that's full of hot air."